At least eight British tourists were wounded when car bombs ripped through two hotels and market in the Red Sea resort of Sharm el-Sheikh in Egypt, the British Foreign Office said on Saturday. "Eight Britons have been injured, but we cannot confirm reports of Britons being killed," a spokeswoman said. "34 of the dead are as yet unidentified. So there could be more difficult news to come," Britain's ambassador to Egypt Derek Plumbly told BBC television. In a later interview it was said that deaths were likely and a "number of Britons" may of died. Egyptian authorities initialy put the death toll at 75 but this has since increased to 88 with up to 200 wounded. Two Britins are missing. 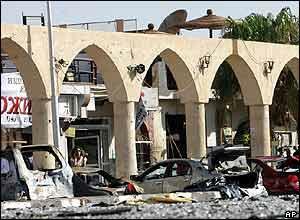 It is reported that an Al-Qaida-linked militants have claimed responsibility for Egyptian resort attack online. It says the attack was a response to what it says are the "crimes committed by the forces of international evil," which the statement says "are spilling the blood of Muslims in Iraq, Afghanistan and Chechnya."